Twenty years on from Gayoom’s landmark speech at the UN, the scale of ‘man’s intervention in nature’ has risen to unprecedented levels in the Maldives. The present and future generations of the Maldives will, without a doubt, suffer what Gayoom described as the ‘errors of the few’, now led by his brother Yameen Abdul Gayoom. Maldives today is a capitalist dream. Mega development projects that aspire to ‘change the very map of the country’ are underway across the length and breadth of the 1200 islands spread across roughly 90,000 square kilometres of the Indian Ocean. No less than ten dredging projects are ongoing, reclaiming land at the expense of the coral. A bridge is being built to connect Male’ the capital with the island of Hulhule’, home to the country’s main Ibrahim Nasir International Airport. It matters not that the island is only a 10 minute boat ride away, five minutes on a speed boat. 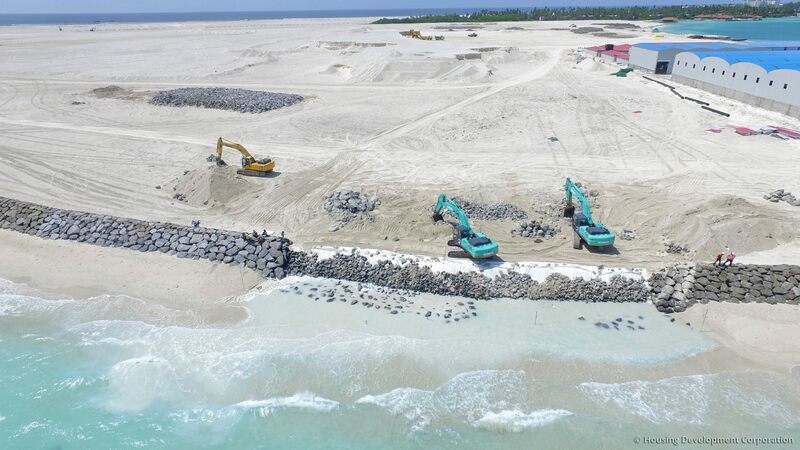 Already connected to Hulhule’ is the aritifical island of Hulhumale’, two square kilometres of land dredged from the ocean to alleviate the extreme overcrowding in Male’ which is home to over 150,000 people. Recently, Hulhumale’ has been expanded further to connect it to the island of Farukolhufushi, once a small tourist resort. There is talk that once the ‘China-Maldives Friendship Bridge’ is completed, the construction of a new bridge may begin, connecting Male’ to Villingili, another ‘suburb’ of Male’ where close to 7000 people live on 0.3 square kilometres, unable to find accommodation on the capital. Together, Male’, Hulhumale’, and Villingili is to become The Greater Male’ Area where at least 70 per cent of the population is to live. The Nasir Airport will be developed to cater to at least 7 million tourists by 2018, the government has said. Contracts to develop new terminals have been awarded to two state-aligned foreign companies: the Binladin Group of Saudi Arabia and China’s Beijing Urban Construction Group. The Beijing company will build a new 3.2 kilometre runway, a fuel farm, and a cargo complex for which the Maldives government secured a US$373 million concessionary loan from the Chinese EXIM Bank. The Binladin Group, which will build a new passenger terminal for an undisclosed amount, was recently suspended by Saudi Arabia for the Mecca crane disaster. Meanwhile, the Chinese company building the China-Maldives Friendship Bridge, CCCC Second Harbour Engineering Company for US$210 million, is blacklisted by the World Bank for fraudulent practices elsewhere. Almost all workers on the bridge are Chinese. The north eastern corner of Male’ from where the bridge starts is now occupied by Chinese workers. What was once the most popular recreation area for the people of congested Male’ is now off limits to them, reserved for prefab housing for the Chinese workers who have moved in with entire families. The nearby Artificial Beach has become a popular spot for their leisure, leaving little room for locals who have found themselves crowded out of yet another rare open space. Where big red ugly platforms for the new bridge now rise from the sea once rose majestic waves, which had earned the area its name: Varunulaa Raalhugan’du – Uninterrupted Waves. Raalhugan’du was a popular surf spot where international award winning surfers rode the waves or spent the day watching them in an area of the beach they cleaned, grew a garden in, and enjoyed the beauty of nature Maldives has to offer. Today surfers get arrested for surfing, protests lead to jail and the government’s promise that it will arrange free transport to alternative surfing spots has turned out to be empty. Waveless and ‘homeless’, the surfers despair of ever getting back their way of life.